Communication between the server and the clients in Elvis are all HTTP-based and is not encrypted by itself. For internal Elvis setups this provides the best performance. Most data is transmitted by using the binary AMF protocol, which by nature makes it hard to read, although there are tools available to parse it. To create a secure connection you need to set up HTTPS. This is done by using the HTTPS Setup page in Elvis. Note: This step needs to be done on every node that you want to access using HTTPS. For Elvis 6.16 or higher: access the Management Console and in the menu on the left, choose Tools > HTTPS tools. For Elvis 6.15 or lower: access the Admin pages and choose 'Https setup' in the menu bar. Step 2. Follow the instructions on the page. Tip: If the password for the key differs from the Keystore Password you will need to manually change the httpsKeyManagerPassword property in the config.properties.txt file. By default, when a domain name is typed into a Web browser, the browser will try to connect to that domain over HTTP. However, when HTTPS is configured, you typically want the server to redirect the Web browser to HTTPS so that the user always connects over a secure connection. Step 1. Ensure that the Elvis node is set up for HTTPS as explained above. Step 3. Restart the Elvis service. Note: More and more customers are running Elvis on Amazon AWS and on HTTPS. AWS CloudFront can redirect HTTP to HTTPS automatically, but an AWS load balancer does not have such a setting. When only using an AWS load balancer, the Elvis nodes will need to provide the redirect from HTTP to HTTPS. These steps can be used to convert an already signed Apache private and public key pair for use with Elvis. Step 1. Create a .txt file file with a chain of your certificate with all intermediaries, down to the root certificate. Note: Depending on which CA you used, you may need to merge not just your own crt and the root crt, but also one or more intermediate .crt files. Step 2. Create a pkcs12 file from the key and certificate chain. Step 3. Import the produced .pkcs into a new keystore.jks file. 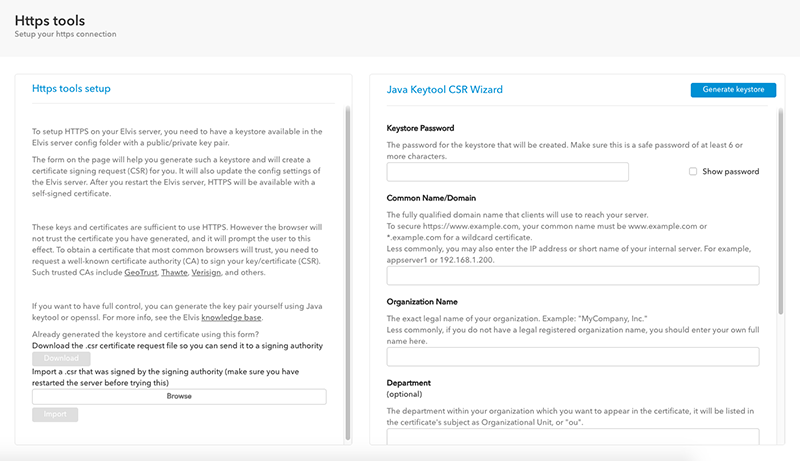 Note: The keytool command comes bundled with the Java JDK. Make sure to use the one from Java 1.6 or 1.7. -srcstorepass -srckeypass -srcalias -destalias -destkeypass -deststorepass. Step 4. Place the produced 'keystore.jks' in the Config folder. Step 5. Find out the name of the alias. If you followed the previous steps, this alias will probably be '1'. Step 6. Configure the following settings in the cluster-config.properties.txt file. Note: For information about how to edit this file, see Changing the Elvis 6 Server configuration for a running cluster. Important: To obscure the password, use the Jetty tools. # Use the HTTPS setup tool on the Elvis server admin page. Step 7. Restart Elvis Server. Windows: Add the following extra line to C:\Program Files\Elvis Server\elvis-service\elvis-service.conf (make sure to use a free number). OS X: Add the following line just above the -jar argument in /Library/LaunchDaemons/com.dutchsoftware.elvis.server.launchd.plist. 5 June 2018: Added information about accessing the HTTPS page in the Management Console.